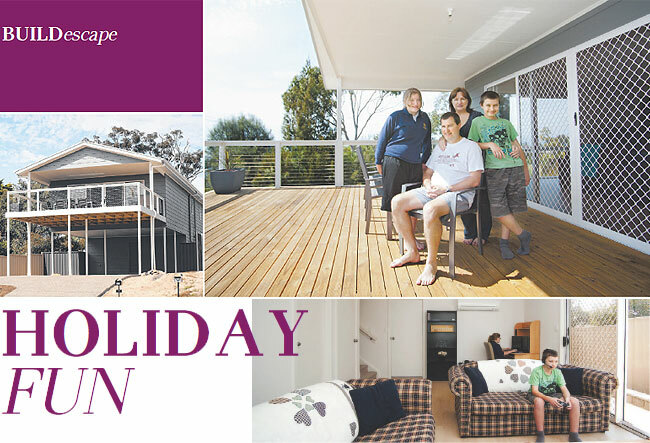 Open living areas with large windows, easy cleaning options and plenty of space for friends and family make this holiday home an ideal retreat. For Brett and Anne Baker, creating a home away from home to share with their children has been a long-term goal. "We had been toying with the idea of building a holiday home for some time," Brett says. "After about two months looking for a suitable block of land around Victor Harbor we found one we liked. It is on top of a hill so it has nice views of the sea, looking back over the town. "There were a couple of options we had when it came to the design but after choosing the block we found the McCubbin two-storey home would be the best choice for us." On the second level is the main bedroom with ensuite and walk-in wardrobe. A galley kitchen overlooks the combined living and meals area. "By adding larger windows to the living areas we maximised the views. We also extended the second-storey balcony decking area, giving us a great area for entertaining," Brett says. Downstairs is the second living area and two bedrooms, both with built-in wardrobes. The main bathroom, laundry with outdoor access and a linen cupboard under the staircase are also on this level. "Our idea was having the option of adults enjoying themselves upstairs while the children can do their own thing in the second living area downstairs," Brett says. "We also have a couple of extra sofa beds downstairs so when we have a few extras, there is still plenty of room for people to sleep. "So far the most we have had stay over at the one time is nine people and the house coped well. "The open-plan area on the top level gives us the space we need for everyone to come together at meal times or just to hang out together. While the decking is great for having barbecues." Laminated floorboards were chosen for the living areas for easy cleaning. "Often we all go down for a walk or swim at the beach and then a lot of sand gets tracked back into the home," Brett says. "With the floorboards it's just a matter of a quick sweep." Extra insulation for the floors, ceilings and walls, smaller windows in the bedrooms and thermal glazing on the large picture windows means the home has achieved a six-star energy rating. The family visit most weekends with extended stays planned for the school holidays. "We plan to hold on to it for a while," Brett says. For more information about the house in this story please look at the McCubbin 2 Storey Front Carport (3 Bed).